In honor of turquoise; one of the official birthstones for December; we shine our spotlight on the Empress Marie-Louise Diadem, a gift from French Emperor Napoleon I to his second wife on the occasion of their marriage in 1810. Other December birthstones include blue zircon, blue topaz and tanzanite. 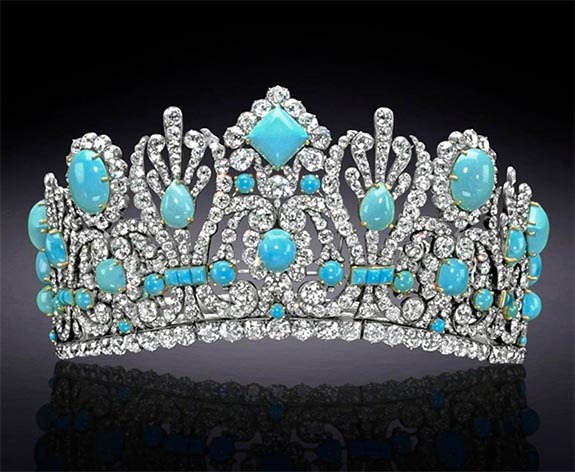 The spectacular piece, which now resides in the Smithsonian in Washington, D.C., features 70 cabochon cut pieces of Persian turquoise weighing a total of 540 carats, as well as 1,006 old mine cut diamonds boasting a total weight of 700 carats. The diadem was one piece in a matching set that included a necklace, earrings and a comb. Interestingly, the emperor's wedding gifts were originally set with emeralds. According to the Smithsonian, Marie-Louise (1791-1847) bequeathed the diadem and accompanying jewelry to her Hapsburg aunt, Archduchess Elise. In 1953, Van Cleef & Arpels acquired the jewelry from one of Elise's descendants, the Archduke Karl Stefan Hapsburg of Sweden. Some time between 1956 and 1962, Van Cleef & Arpels reset the diadem with beautiful sky blue turquoise. The remodeled diadem was exhibited at the Louvre Museum in Paris along with the necklace, earrings and comb, as part of a special exhibition in 1962 focusing on the life of Empress Marie-Louise. The best quality turquoise is a pure, radiant sky blue. While the earliest known turquoise mines were in the Sinai Peninsula of Egypt, today turquoise is found in the USA, Mexico, Israel, Iran, Afghanistan and China. Turquoise is one of three official birthstones for the month of December. The others are tanzanite and zircon. Credit: Photo by Chip Clark/Smithsonian, digitally enhanced by SquareMoose.